Oasis Walnut leather cover, the Oasis itself, and a Voyage. The Kindle Oasis is for the connoisseur of e-readers, the person who reads a lot on them and who also enjoys the feel of a premium device in the hand. 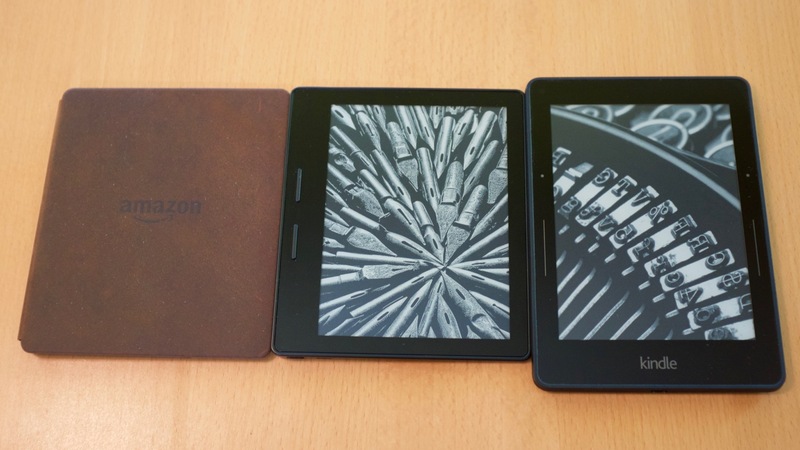 Because that’s what you’re spending close to an extra $200 on, compared to a lowlier Kindle like the Paperwhite: page-turn buttons, more even backlight, lighter weight, and a very nice leather cover. Apart from that, the software is (sadly) much the same and the speed of the device is much the same. The leather cover (sorry, vegans) does look and feel premium, and since it holds moar battery, this Kindle can go for longer than previous versions—not that they were ever slouches in the battery department—by sipping from the cover when it’s attached. The drawback with this sceme of using the cover as a battery pack is, of course, if you use the Oasis without the cover you have a Kindle with terrible battery life. So as hardware it’s nice—an excellent reading machine. But Amazon keeps making me sad by not delivering best-of-breed software. Amazon is in the business of delivering good-enough. The most egregious example is that the Kindle still doesn’t have automatic hyphenation. In 2016. Nope. You’ll see the rivers of white and you’ll like them, dammit. Just because we have a screen that aptly mimics paper doesn’t mean we should think about typography, does it? As an example of the patented Amazon Attention to Detail™, the instruction manual preloaded on the devices says Welcome to your Kindle Placeholder. Yes, Placeholder. And the title is Kindle Solstice. That is some attention to detail. I so, so wish Apple would get into the e-ink reader market, but it doesn’t look like that will ever happen—imagine an e-ink device running iBooks. Wistful sigh. If Apple had that, their bookstore might actually take off. But in this universe we have Amazon’s Kindles. And this one is physically a very nice device, one that’s worth upgrading to if you read a lot and appreciate the finer things in life, but not one that will get you meaningfully more than a cheaper Kindle. As a side note, if you happen to be a cheapskate and just want a cheap thing to read on, let me implore you to at least get a device with backlighting—it’s a massively nicer experience. Let’s hope the Oasis 2 will come with a faster processor and that Amazon will somehow find the motivation to crack the mysteries of automatic hyphenation. Note: Amazon links are affiliate links. If you purchase through them I get a tiny cut. It doesn’t add anything to the price.